Bank of Thailand announced new commemorative banknote on occasion HM King Bhumibol Adulyadej's 70 year of accession to the throne. size: 89 x 162 mm. Do these odd denominations actually circulate? Or are they made available for more than issue price, so that people don't try to circulate them? It will be sold at 100 baht. And most likely will not circulate at all. People will keep it especailly because it's related to King. I think all 20 mill will be sold out in one week and there may be second printing. Thanks! that's what I was expecting...100 Baht sounds cheap though. They perhaps missed a golden opportunity to make more money. I really like the full length portrait of the king as a young man. I wouldn't hesitate to frame it and hang it on the wall of my study. 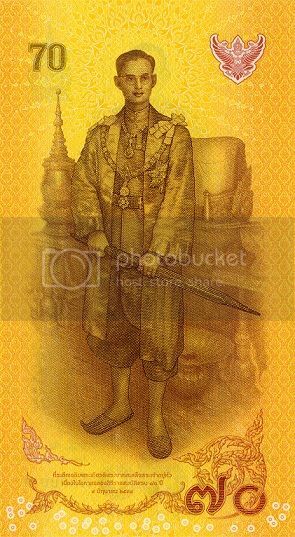 BANGKOK - Thailand basks in yellow as nation celebrates longest-reigning monarch's 70th anniversary of accession to the throne. 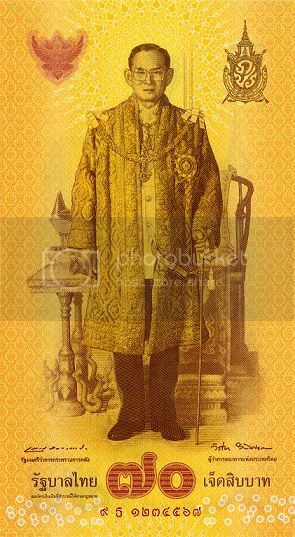 Thailand yesterday celebrated the 70th anniversary of His Majesty the King's accession to the throne. Roads around the Grand Palace were closed yesterday morning for an alms-giving ceremony involving 770 Buddhist monks to celebrate the King's reign. Hundreds of people gathered before dawn to take part in the ceremony led by Prime Minister Prayut Chan-o-cha and members of the Cabinet. Almost all wore yellow. In Lop Buri, more than 200 local residents helped with the dredging of canals and removing weeds to clear the waterways. Long queues formed at commercial banks all over the country yesterday, as people flocked to buy commemorative 70 baht (S$2.70) banknotes printed by the Bank of Thailand to mark the 70th anniversary. The banknotes were sold at 100 baht each and the sale was limited to two banknotes per person. Despite the limit, all the commemorative banknotes sold out at many bank branches just hours after the sale began. A total of 20 million of the commemorative banknotes have been printed. The central bank said more could be printed if demand was high. Chuanpit Luapattanapadung, a 65-year-old resident of Surin, said she had obtained two 70 baht banknotes and that she would give one of them to her mother. "I wish His Majesty good health and speedy recovery from illness," she said. One of those participating in the alms-giving ceremony at the Grand Palace, 68-year-old Bangkok resident Chonmanee Smativat, said: "I want to make merit for the King for him to have good health. That's how I can show loyalty to him." The signatures are by finance minister Apisak Tantivorawong (at left) and governor Veerathai Santiprabhob. This is the 87th and last signature combination on Thai banknotes.